Play pirate party games at your party! 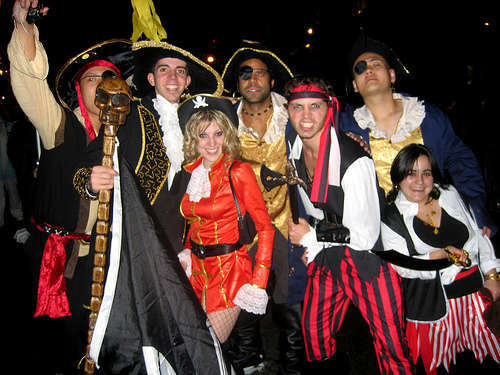 Get out your costumes and set sail! Let us spice up your party with some great pirate party games that are easy to set up, learn and fun to play. Arrr! 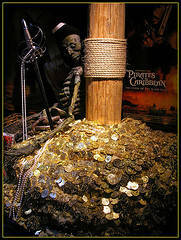 So you're into old tales of Blackbeard or the new adventures of Captain Jack Sparrow, and you have an event that you would like to theme around your love for pirates? Congratulations first, on having the ingenuity to think up such an event! Similar to Capture the Flag, only instead of going after a flag, two teams will compete to rescue a damsel from the opposing side. If you have a large field, you can use paintball guns. If you are in a backyard, tennis balls with paint will work just fine. Players must endeavor to cross the field without getting hit, grab the damsel, and bring her back to your territory. The main difference is that once hit, players are still dead, but can return as Ghosts for your team. Being a ghost means that you can no longer rescue the damsel, but you can block the opponents from hitting your teammates who are still alive. This most popular of pirate party games is similar to an Easter Egg hunt and can be fun for party goers of all ages. No matter the age of the partyers, candy is always fun to find and eat. You can put hidden messages in the candies containing hints or little tasks to do to jazz it further up! Best done over a swimming pool, "Walking the Plank" can be used as a "punishment" for losing any of the other games. You can also just put a plank somewhere on the ground at your party and make a big show out of each "execution"! Have all your pirates yell "Arrrrr!!" for added effect! You Sank My Pirate Ship! Have two teams line up across a table with ping pong balls and plastic cups. The object of the game is to sink your "cannonballs" (ping pong balls) into the other team's ships (plastic cups). The rules usually state that each team is to stay on their side like a tennis match, but this is usually a rule that is not followed for long, and to good effect. 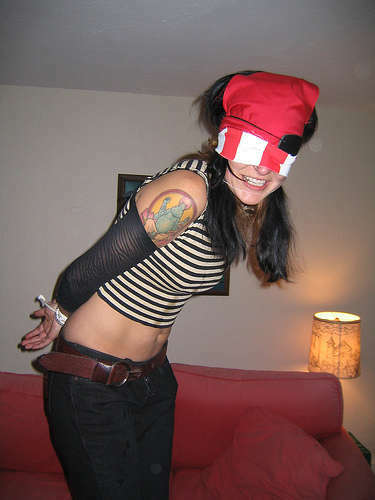 What would pirate party games be without a little rule breaking? A lost treasure is given to one person for this pirate party game. None of the pirates know who this person is, but they must weed out the thief before a certain time limit, or the treasure will cause a great mutiny. To weed out the thief, pirates may ask questions until someone accuses another. If the accuser is wrong, he must immediately walk the plank for his mutiny. If (s)he is right, then (s)he becomes the new holder of the treasure (usually candy, but these prizes can get really imaginative). 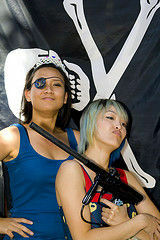 Good treasures include water guns, water balloons (that can be used on other pirates in the next round), candy, etc. If you want to make it even more fun, add some cursed treasures into the mix! Those contain not-so-yummy stuff like a piece of broccoli instead of sweets, some raw eggs to throw on or a message daring the cursed finder to crush them on his head! This game involves taking ping pong balls across the deck before the other team can do the same. Divide up the party into two teams, and then split the teams into opposite sides of the floor. Once one person swabs the deck to the other side, he or she hands the broom off to his teammate, who must then swab the ping pong balls to the other side. You may need coloured ping pong balls to differentiate teams, but if they are all the same colour, the confusion may actually add to the hilarity! 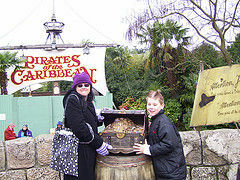 When everyone's ready, disguised and eager to find some treasure, it is time for a Pirate Treasure Hunt! How about playing these Pirate Party Games in combination with some great Pool Party Games?